At the ground floor of Link Hotel in Tiong Bahru, is Blue Garden Korean BBQ Restaurant. It currently occupies the space which was used by the now-defunct Persimmon Restaurant. Much of the interior remains intact: the black and white tiled floor, and the kopitiam-style furniture. Korean food lovers will be happy to know that Blue Garden restaurant offers Korean BBQ buffet during lunch ($19.90) and dinner ($26.90). My definition of buffet: be prepared to eat a lot. 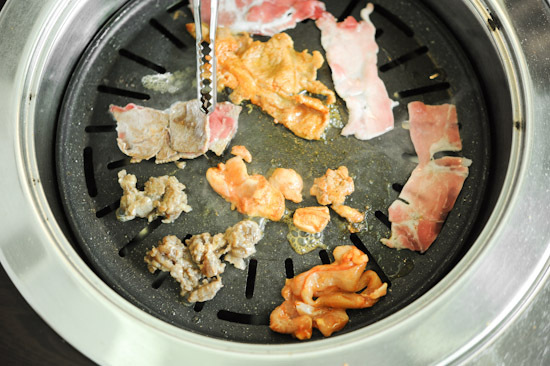 The Korean BBQ Buffet offers free-flow of Korean dishes like Korean Ginseng Chicken Soup, Kimchi Pancakes, Korean Spicy Rice Cakes (Ddukbokkie), and a variety of Kimchi (Spring Onion, Cabbage, Leak, Cucumber). The truth is, Blue Garden’s appetisers are pretty run-of-the-mill. We tasted a bit of everything as we were saving our stomach for the highlight of Korean BBQ Buffet – MEAT! … And of course, we were there for the meat. The Korean BBQ Buffet has free flow of Pork Collar, Beef Belly, Pork Belly, and three different types of Bulgogi (beef, chicken and pork). Read my lips: this is an all-you-can-eat-buffet. Amongst the four of us, we ate enough meat to last us for a week. We ate, and ate and ate. We totally threw the diet plan out of the window – it was crazy! If you are not a big meat-eater, the Korean BBQ Buffet also has seafood and vegetables. But trust me, you’d want to just go for the meat. Wow, I think I am very good at giving advice! Remember, just go for the meat. I had some white rice to go along with the meat, but mostly I wrapped the BBQ meat in lettuce leaves. After a while, I was too lazy to put it nicely into the lettuce so I ate the meat directly from the BBQ pit. The bulgogi is delicious! Considering that places like Crystal Jade Korean Restaurant charges $18 for a plate of marinated meat, I think that Blue Garden’s Korean BBQ Buffet is very reasonably priced. Looking for a cheap and good buffet? Find a group of friends who love meat and go for the Korean BBQ Buffet! One thing to note though, the air ventilation was almost non-existence; our clothes smelled like Korean BBQ after we were done. I’m a big korean bbq fan! Thanks so much for this post! I’ve tried Red Pig bbq restaurant (the garlic chicken bbq is nice) and soju bang at tanjong pagar (20 sgd they only open from 530pm- but they use hot grills, not like this one). I’ll go and try this one too! thanks!!! Went there for the bbq buffet.meat is well marinated and delicious. I love the garlic chicken very much.They only serve plain water and other drinks have to be purchased separately. I thought that the korean bbq at katong is better but of course,the price is slightly more expensive too. Came to this website and i went to try at this restaurant. It really really is not value for money and totally ruined my day. Firstly, the service there is really bad (and I dont know why we have to pay $10 for service when we practically don’t feel served at all). Point to note: we were the only ones there. I would say that the service is quite bad because they seem to be unhappy when we ask for them, because the meat just don’t seem to cook (fire is not strong enough) so we ended up eating cooked food instead (defeats the purpose of going to a kor BBQ). Secondly, the variety of food is really limited. Continue: All the soup and cooked food served (even the fresh ones) were all cold! If not, just Luke warm. (Even the ginseng chicken soup, which does not taste like ginseng chicken soup -.-). Thirdly, they only served plain water. I am mostly disgusted by their service because I see them sitting down, chit chatting with one another (wa, so easy to earn money ar). Seriously, for around $22, I will choose Seoul garden over this any day! Seoul garden is cheaper, more variety of food and the service there is 100x better. Not to mention, they have soup base for you! I will rate this restaurant 2/10. Really bad experience and regretted coming here. Now call New Blue Garden Korean BBQ.Had lunch with friends for buffet last saturday @ $19.90 + service charge but no service at all. The meat section is limited.Cooked food were cold, dukbokie is hard.Garlic chicken wing quite tasty.Not worth a try for the price plus no dessert at all. Disappointed. Quite a disspointing trip, the cooked food were cold, and when it runs out, they don’t replenish. (8.30pm) Cook food were mostly tasteless.. and the korean rice cake were too hard.. soup were blend.. and as what others mentioned, the service was bad..
One try is too much. Overall rating is 2/10, will not go again. The food at this place was lousy. Very limited selection, and like the others before me said, the food was cold. By the way, we made a mistake of ordering Tiger Beer there, and they charged us $30 per bottle. PER BOTTLE! Yes, you read that right. I will never visit this restaurant again. I ate at Blue Garden bbq restaurant last week. It does not use charcoal Bbq unlike Ju Shin Jung restaurant. and (West Coast) branch, you will feel this place has more variety of meats . However, I do agree there is limited variety of cooked food and you have to pay for your own soft drinks. Tried yesterday. Eat myself happy. 2 pax spent around $60. Ordered a coke $2. Dinner time. Have free flow ice water . Good food, clean environment. Plenty of good beef and most importantly pork belly meat! Why do you all say cooked foods are tasteless? For those people out there, the meat is standard, not too low quality, not too extreme. Thus, taste depends on how you cook. Maybe they don’t know how to cook? they don’t know that Koreans dip the meat into salt/soy paste + wrap in vege. and they probably over cooked it. Some retards just complain when it’s their own fault. I just went on a sunday evening, not much crowd though abit warm. The cooked food section is average with a few dishes that are nice. Variety of the buffet is pretty decent, not lacking but just nice. The meat is pretty good. I took the pork collar, beef belly, marinated beef belly, beef ribs. The bulgogi chicken is decent, bulgogi beef abit salty. The bbq are mainly for the meat. I’m a meat lover so no qualms about that. Pretty great place for cheap and good korean bbq just like the author of the blog said. I never expect for any service during a buffet, just minimum service like clearing plates etc. Since buffets are mainly self service oriented. To be honest, I was surprised to see a conflict in the reviews here left by some of the comments. But I was glad I went for it, it was pretty decent, maybe others need to learn how to be less demanding.